Stay in the shadows with this cool & fun spy design! He'd be perfect on a tote bag, back pack or other decor! 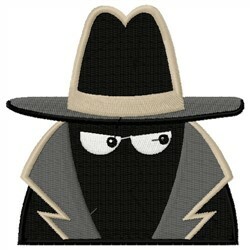 Embroidery Stitches is happy to present Shadow Spy machine embroidery design which has 16210 stitches and is [95.76 mm x 96.52 mm] large. If you would like to view more embroidery patterns please search on our embroidery designs page.